British Airways and American Airlines will invest $344 million to expand and improve John F. Kennedy International Airport (JFK) Terminal 8 as part of a comprehensive joint public-private partnership to completely overhaul the New York City airport. The Terminal 8 enhancements are part of an agreement between the Port Authority of New York & New Jersey and American Airlines to ready the terminal in preparation for British Airways moving from its current location in Terminal 7 and joining American in Terminal 8. Terminal 7 will be replaced as part of JetBlue Airways’ plan to build a new terminal on the airport’s north side. The American Airlines and British Airways investment will add 70,400 sq. ft., including 33,000 sq. ft. of new public space, while 57,500 sq. ft. of existing space will be refurbished. New amenities will include premium lounges for both carriers, enhanced baggage systems, premium check-in space and upgraded concessions. Included in the project will be five additional wide-body gates to allow for more transatlantic flights and four nearby on-airfield plane parking/unloading areas. When completed early next decade, Terminal 8 will be able to handle 14 daily flights to London. New York officials stress that no Port Authority funding is being committed to the Terminal 8 upgrade. All told, $13 billion will be invested as part of the plan unveiled by New York state in October 2018, to completely upgrade JFK. 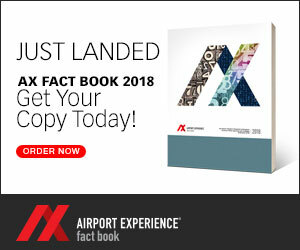 The plan, 90 percent of which will be funded by private investment, calls for a unified and interconnected airport featuring two new international terminals with state-of-the-art passenger amenities, convenient ground transportation options, and better roadways around the airport more roadways that will eventually boost JFK’s annual capacity by 15 million.